Santa Claus: Good morning, Mrs. Claus. Christmas Eve — biggest day of the year! Wakey-wakey! Mrs. Claus: *growls* Close the shade. Too bright! Mrs. Claus: Alright, I’m… outta bed. Santa Claus: Good job, ginger cookie! I have to prepare the sleigh. Can you make sure all the toys are finished and ready to go? Santa Claus: That’s my sober girl! Worker Elf 2: You know our names aren’t “Egg” and “Nog”, right? Mrs. Claus: Who cares? How’r the toys coming along. All done? 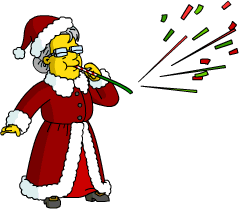 Mrs. Claus: Shh! My husband doesn’t know about my drinking. Worker Elf 1: Honey, if he doesn’t know at this point, he doesn’t WANT to know. Mrs. Claus: Okay, elves. We’re a little behind on the toy front. But we’ve got twelve hours to make a billion presents. No sweat, party people! Worker Elf 1: Will you put down the eggnog? Worker Elf 2: Just go away! Let us work for once! Mrs. Claus: Okay, how we doing, elfishes? We must be swimmin’ in friggin’ toys by now. Worker Elf 1: No thanks to you! Mrs. Claus: Hey, watch it, Elf! I can have you melted down whenever for why-ever. Look, I had a bad morning. So I took a much-needed nap. Then a shvitz, another nap, and now I’m on my game. Let’s make some friggin’ toys. Worker Elf 1: There’s no time! We’re not going to make it! Mrs. Claus: Nonsense. I’m here now. I have a hammer, and a paintbrush, and who’s up for making a billion friggin’ toys, jerks?! Woo-hoo! Worker Elf 2: I can’t believe it! We finished the toys! Worker Elf 2: Don’t wake her! I’m honestly hoping Santa finds her like this. He needs to realize what she’s become. Mrs. Claus: Woo-hoo, elfs! Mama Claus in da house! Toys be finished and whatever! Let’s celebrate! Santa Claus: Mother?! You look a wreck! Don’t tell me you’ve been drinking eggnog during the day. Mrs. Claus: Oh, lighten up. Have some fun for once. S’Christmas time! Santa Claus: Wait a minute, some of these toys are still wet with paint. Don’t tell me you all didn’t finish your work until the last minute?! Again! Mrs. Claus: Okay. There’s a perfectly rational ex’plation. Let me go be sick in the john, and I’ll tell you all ‘bout it. Santa Claus: Oh goodness, you’re in no state to be out of bed! Boys, load up the sleigh while I take care of the missus. Worker Elf 1: Right away, sir! Worker Elf 2: We love being helpful and employed! Santa Claus: Now dear, you’ve obviously come down with some sort of stomach bug. It’s the only explanation for your symptoms. You sure you don’t want me to stay home tonight? 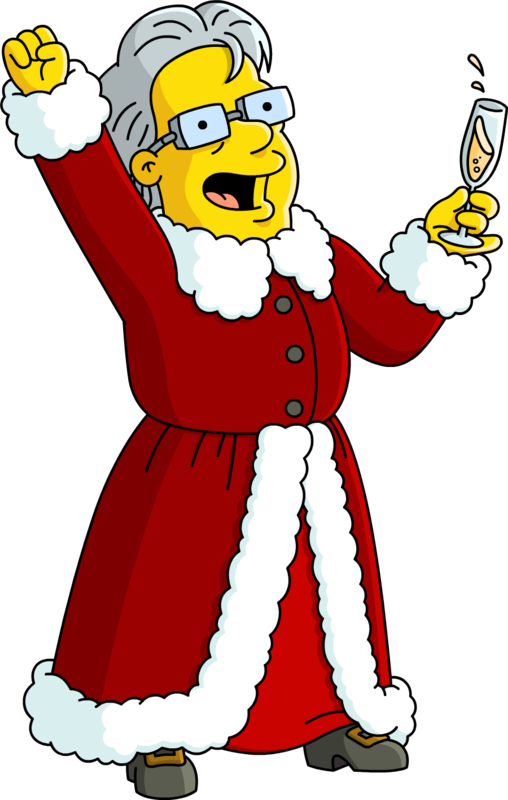 Mrs. Claus: *hiccup* No, it’s the most important night of our year. You go. The elves will look after me. Santa Claus: Feel better, love. Mrs. Claus: *rips back blankets and jumps out of bed* Alright boys, the Christmas Spirit has left the building, so you know what time it is! Worker Elf 1: How is she still standing after today?! 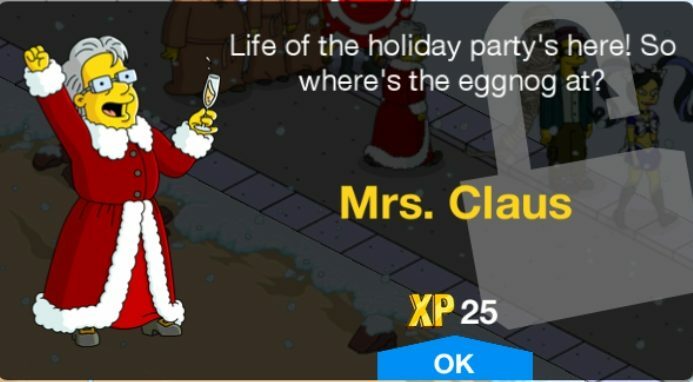 Mrs. Claus: *hiccup* Where’s the rest of the eggnog? Egg! Nog! Booze me! Worker Elf 1: You did a ‘nog keg stand and chugged the rest of our supply! Worker Elf 2: Okay, look. We got lucky this year, but I REALLY think we should get an early start on next year’s presents. Whaddya say? Mrs. Claus: Good idea. Let’s start by making ten thousand gallons of high-proof eggnog . *hiccup* Woo-hoo! And that’s it my friends, the details on the third Christmas 2018 week 4 prize! Thoughts on Mrs. Claus? Her questline? Tasks? Have you unlocked her yet? Close? Sound off in the comments below, you know we love hearing from you! 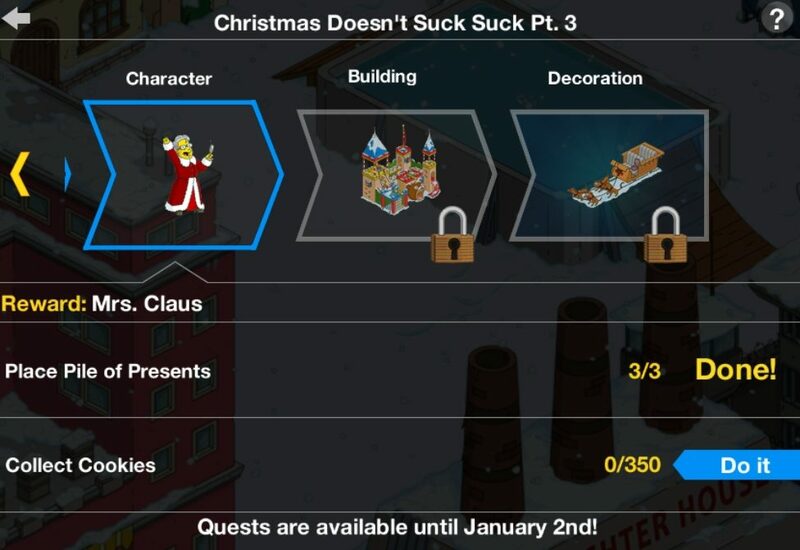 This entry was posted in Decorations and tagged Christmas 2018 Prizes, How do i get Mrs Claus, Mrs Claus Questline, Mrs Claus Tasks, Tapped Out Christmas Event, Tapped Out Tips and Tricks, The Simpsons Tapped Out, TSTO Addicts, TSTO Christmas 2018, TSTO Simpsons Christmas Special, TSTO Tips and Tricks. Bookmark the permalink. If the next event isn’t better I’m considering putting this game on the shelf. 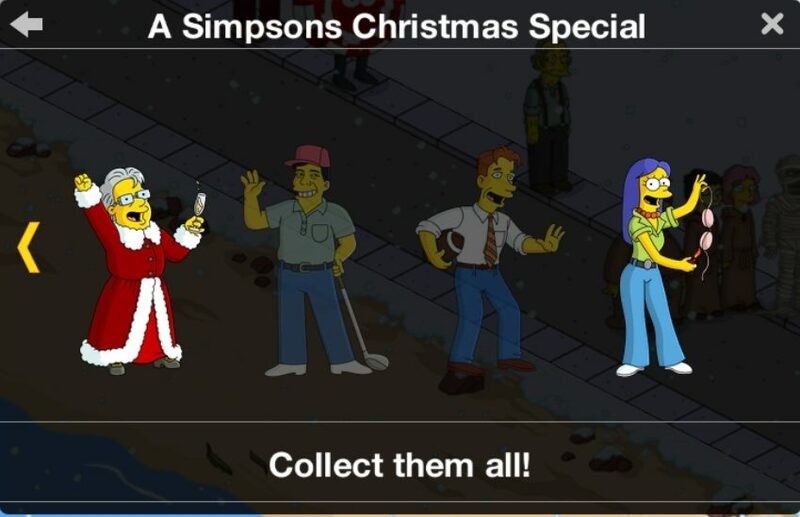 Yeah, I’ve spent years on it (because I LOVE the Simpsons), but it’s getting more and more boring for each event. Pretty sure I’m at a cross point where I’m just too fed up with how bad it has gotten. This Christmas event certainly didn’t help, it was just lame and boring. So I hope the next is better (but probably not). I got her yesterday and I like that she uses Santa’s House for her tasks and is another character that can go to bars. It’s a shame that we have to wait for both her visual tasks to appear instead of one like the last 3 characters had. This week’s story should have happened before Christmas and finished with Bart’s story instead. I wonder if Santa will get his ‘Pine for Mrs Claus’ task replaced. Mrs Claus makes me think Kathy Bates is in my town! Happy early New Year’s to all the addicts/posters/viewers of this blog! I plan on buying it, if that helps. Ouch! $99? That’s pricey. Even if it is for 3600 donuts.